← Daddy, bed. Daddy, nap. When Mike Neir had the grave misfortune of being tackled, trounced and dragged into my world, he inherited my two dogs along with me and my insanity. We have one probable shepherd/husky mix, and one certain border collie/gazelle mix. Bell, the gazelle half-breed, normally sits at my knee level. She’s a little thing, only about 50 pounds. However, when Bell’s excited, she wants to look a person right in the eye. And so she jumps. She jumps straight up, off all fours, and is suddenly at eye level – for a fraction of a second, after which time she lands and Tiggers right back up again. An arrival home happens like this. The garage door goes up, car drives in. Car door opens, one hears Sumi’s excited “woo-woo-woo” howls emanating from immediately behind the door to the house, accompanied by the clitter-thunks of Bell’s feet hitting the floor as she (one can only assume) comes down from the ceiling, where she spends most of her day. One opens the door and it is immediately the very image of a Furried Frenzy. Sue bumps and nudges and A-WOOOO-woo-woo-WOO’s, and Bell tries very hard to remain constantly in one’s face. One wades one’s way from the door, through the kitchen, into the den, where the carpeting makes it a bit less likely either dog is going skitter into a tailspin. More jumping, more woo’s, a lot of barking from Bell. One greets the dogs, they show off their toys, then we all proceed outside for Very Important Matters. Today, in amidst the Canine Chaos, I walked right past something Mike Neir spent a good two hours working on. Twice, really. I walked by one thing in the garage, and another in the kitchen. He hauled that giant mess out to the garage, where he compacted everything and made it fit into even less space than the giant stack that was there before. This will make hauling it to the recycling center considerably easier. Yay, Mike Neir! PS – Homemade Mac & Cheese blows without any milk in it. Sucky reward, alas. Really amazing! He is a keeper! Wow, not sure how he got it all to fit! YAAGH! NO CHEESE! Even reading about other people eating cheese is causing me gastric distress. I thought you liked Mike Neir? Then why feed him cheese? Elle – He really is a keeper. 🙂 I didn’t show the pile still in the garage where it all lives now, but he did compact everything down nicely. T.O. 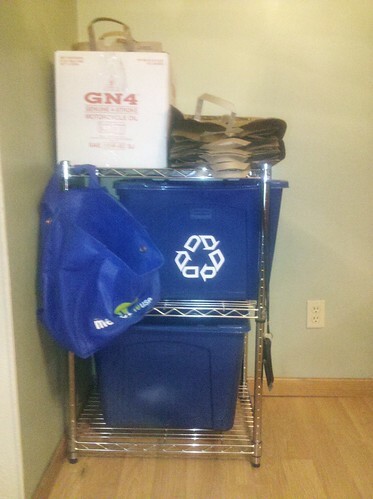 Erin – I kind of figured he’d either unpacked the basement, or did something with the recycling, yah. PHawk – I wholeheartedly agree, humans did not evolve to eat cheese. However, I reckon I am furthering our species’ development toward that goal. Ha!